Last year at MWC, HMD Global launched the newly resurrected Nokia on a global scale, and made it memorable by unveiling the new Nokia 3310 (2017). This was a brilliantly calculated move; delighting and amusing Nokia fans, playing on nostalgia, and bringing something much more interesting than a line of formulaic Androidslabs to the market. It wasn’t a game-changing phone by any means, but it led to an incredible outpouring of attention and emotion all over the world. It also gave the Nokia brand the push it desperately needed to be seen as quirky and innovative again. 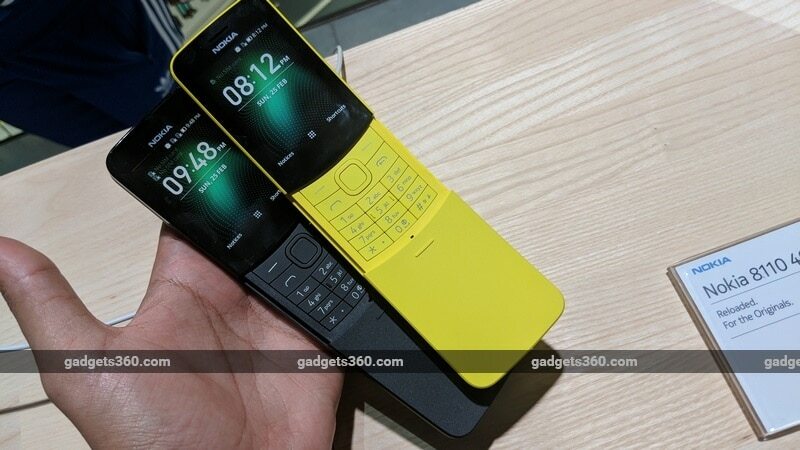 The company is trying the same thing one year later, and of all the iconic and instantly memorable models it has in its archives, it chose the Nokia 8110. This is the phone that was used in the first Matrix movie and everyone can agree that it looked absolutely badass when its sliding cover shot open in the characters’ hands seemingly in sync with their thoughts (which the phone tragically didn’t do in real life). It was high-end and cost a bomb, at a time when all mobiles phones were expensive by nature, which made it pretty uncommon in India at least. It was also built like a tank and felt indestructible. The only thing that the new Nokia 8110 4G has in common with its namesake is the sliding cover – and no, it doesn’t flick open either. It’s highly plasticky, unlike the original which glided so satisfyingly on its solid metal tracks that you couldn’t resist playing with it. This is a low-end phone, based on the company’s Smart Feature OS (which is incidentally based on the same KaiOS as the Jio Phone). In fact, its specifications are virtually identical to those of the recently launched 4G version of the new Nokia 3310, also putting it in line with the genuinely low-end Nokia 1xx series. The screen is 2.4 inches diagonally and has a resolution of 240×320 pixels. You get an ultra-basic Qualcomm Snapdragon 205 processor, and the camera on the back is only 2 megapixels. There’s 4GB of storage and 512MB of RAM. Single and dual-SIM versions will be available in different countries. There is of course LTE support and Wi-Fi 802.11n, but what you can do with them will be limited by the app ecosystem and button-based interface. Anyone who has used a basic Nokia phone over the past 20 years will be able to understand the UI here. We spent a few minutes playing with the new Nokia 8110 right after HMD’s launch event, and the novelty value wore off by the time we were done. The keypad wasn’t very satisfying and T9 predictive text input was painful. We don’t know what this phone will cost in India yet, but directly converting the EUR 79 price works out to roughly Rs. 6,285. That would be insanely expensive on its own, and we still have to account for taxes and duties. It shouldn’t be surprising that the Nokia 8110 (2018) exists solely for publicity and some novelty value. After all, it’s available only in plain black and a bright yellow, in a reference to the “banana-phone” nickname that the original earned because of its curved body. HMD even goes so far as to suggest that people will buy the new 8110 as a “weekend phone” because it’s uncomplicated, or because it has a version of the classic Snake game. All this means that HMD isn’t really targeting entry-level buyers, but is hoping that people with enough disposable income to buy a perfectly capable budget smartphone will somehow find it amusing to play with of these for a minute or two – and pay for the privilege.